Your organization does important work. But are you (or your funders) worried about program sustainability? Do you ever struggle with questions regarding project sustainability on grant application forms? Community Solutions Planning & Evaluation is pleased to announce the release of their new guidebook for nonprofits, Survive and Thrive: Three Steps to Securing Your Program’s Sustainability. More than ever, program sustainability is a concern for nonprofits and the grantmaking organizations that fund them. It’s been estimated that up to 40% of all new social programs do not last long beyond their initial funding. Program sustainability is also a common question on grant application forms and one that many grantees struggle to answer confidently. Nonprofit and program sustainability is the product of a proactive and step-by-step process. 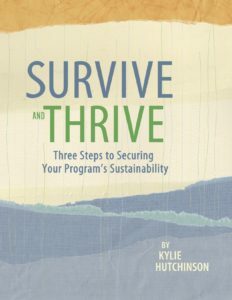 In Survive and Thrive, Kylie Hutchinson guides readers through a straightforward and innovative three-step strategy that ensures their programs have a lasting impact for years to come. Written in an informal and user-friendly style and packed with current research, relevant case studies, and practical exercises, Survive and Thrive is the definitive guidebook for nonprofits on how to develop a sustainability action plan. "Kylie, your time with our group was certainly a highlight last year. Folks loved your book and took it back to their organizations ready to focus on sustainability planning. You were repeatedly named as one of the most helpful parts of the conference with ideas that were practical, manageable, and thought-provoking." "Survive and Thrive is a wonderfully practical handbook for nonprofits who are figuring out how best to sustain their work and its impacts. We are eager to share this with our grantees as part of our efforts to support nonprofit capacity to improve life for all Oregonians." "Survive and Thrive offers a balance of well-researched theory, compelling case examples, and deeply practical tools. Nonprofits, and the consultants that serve them, will delight at the clarity of the three-step sustainability process Kylie describes." "Survive and Thrive uses an easy to understand and well-thought-out model to help grantees assess and build their capacity for program sustainability." "Ongoing program sustainability is an ever-present and demanding issue for nonprofit organizations. Kylie's book is well-researched and chock-full of practical tools, worksheets, and plans for organizations to use while actively planning for their program's future. This book is an essential resource for the non-profit sector." "I want this on my bookshelf – there are lots of practical ideas that I would like to use when thinking about a program’s sustainability. I envision my copy will be dog eared and with lots of scribbling in it. It should be required reading for all non-profits!" - tips, tools, and more! Culled from years of research into what promotes program sustainability and three decades of work with nonprofits, the steps in Survive and Thrive fit every organization, big or small, that wants to ensure its programs not only survive, but thrive. Kylie Hutchinson is principal consultant with Community Solutions Planning & Evaluation and loves producing engaging and useful resources for nonprofits. She has thirty years’ experience assisting organizations of all shapes and sizes across North America to build stronger and more sustainable programs through her popular workshops and webinars. Vantage Point Podcast: Program Sustainability: Doable or Delusional?